Galaxy J 2017: How do I delete fingerprints? How do I delete a existing fingerprint? 1 On the Settings screen, tap Lock screen and security. 3 Unlock the screen using the preset screen lock method. 5 Tick fingerprints to delete. 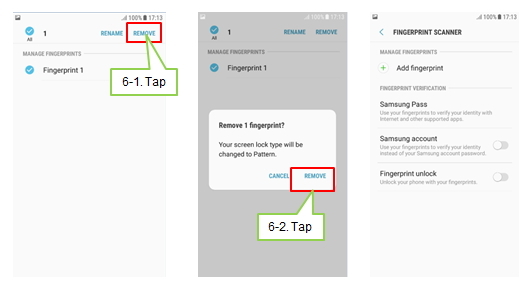 7 If all registered fingerprints are deregistered, the screen lock type will be changed to the preset screen lock method.